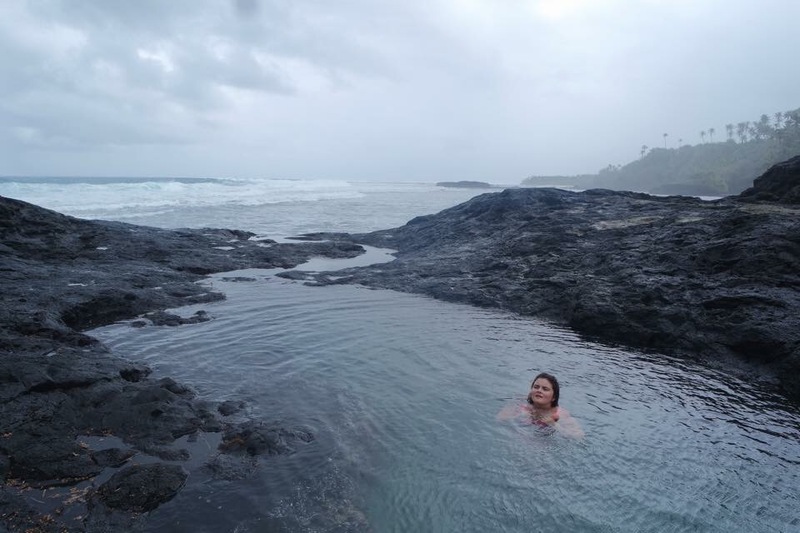 I’ve completely left a part of my heart in this wild, rugged, serene Pacific paradise. Hence why it’s taken me so long to write about it. I didn’t know what to expect, Tom and I had decided to travel a Pacific island while being so close. Originally we were thinking Fiji or Cook Islands, but Tom persuaded me about Samoa. It’s been a place on his bucket list, somewhere he’s always wanted to go (mainly because of the Rugby) but never thought he’d get the chance. Now was his chance, and just from taking one glance at photos of the place, I was in too! 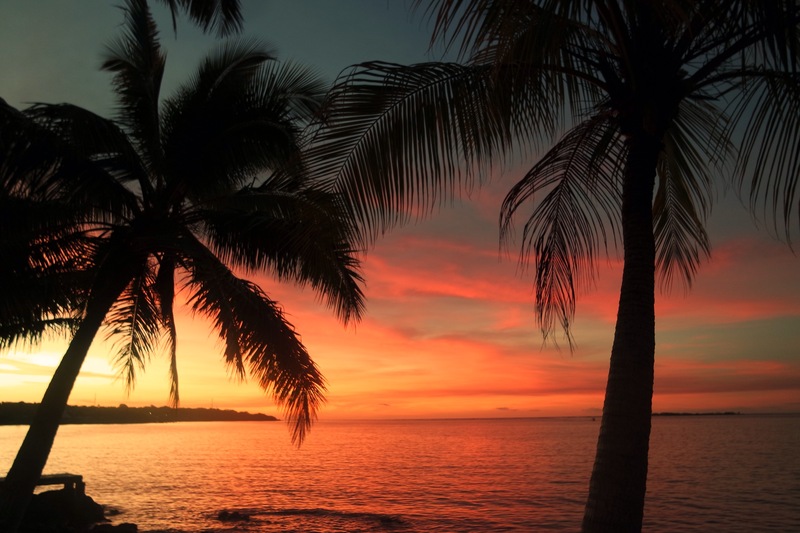 Samoa is made up of two islands. Upolu which is where Apia the capital is and is the more built up of the two. 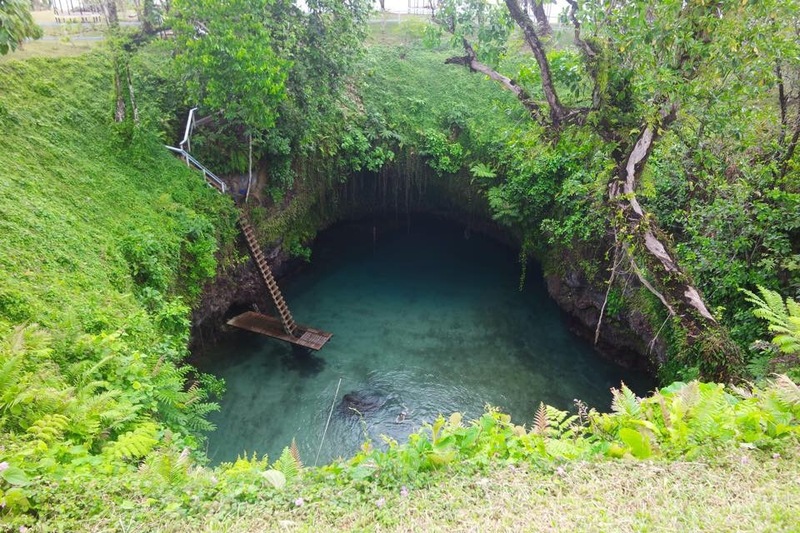 The government here have control over what can be built, unlike the other island Savai’i – which is completely wild, covered in a mystical jungle landscape with harsh cliffs and untouched farm land. The people fought hard to keep the land theirs, it’s like hopping back in time and seeing how the tribal people really lived. The place is literally out of this world. Our Samoan journey began at Auckland airport, sitting in the departure lounge to board our flight. The room was full of Samoan’s with only very few Westerners there. Already I could tell these larger than life people were some of the kindest people I’d ever hope to meet. There was a festival going on in Apia so some were dressed in extravagant outfits, an elderly Samoan couple in particular (who we later shared a taxi with on the other side!) The women were SO sassy and the babies were literally the cutest little humans I’ve ever seen. Anyway, after a fun flight and sitting behind ‘Miss Samoa NZ’ (claim to fame) who was taking part in the festival beauty pageant. We arrived quite late that night. 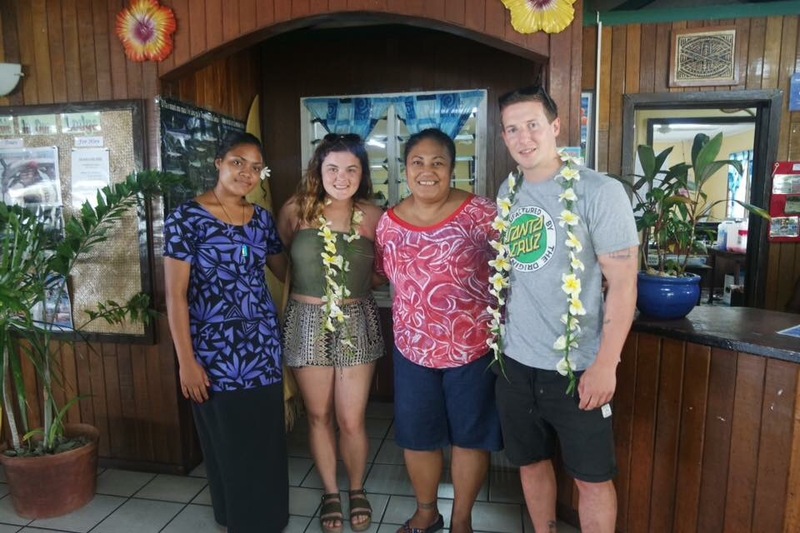 I remember vividly though that drive from the airport to Apia town, and not just because of the super sassy couple in the taxi with us. As I looked out the window, rows and rows of palm trees everywhere you looked. There were flags the whole way into the city and people actually lived in open fales. I couldn’t wait to explore this place for the next three weeks! We spent two nights in Apia exploring the hustle and bustle and festivities including community Zumba and traditional Samoan dancing. 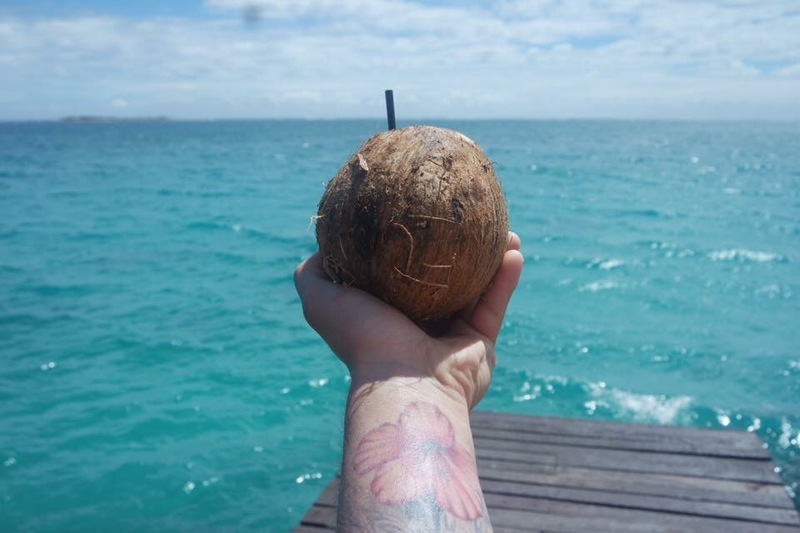 There were plentiful bbq stands and street food, I had my first chilled coconut of the holiday and tried a Fijian curry which was delicious. I loved that it was island sized portions too! 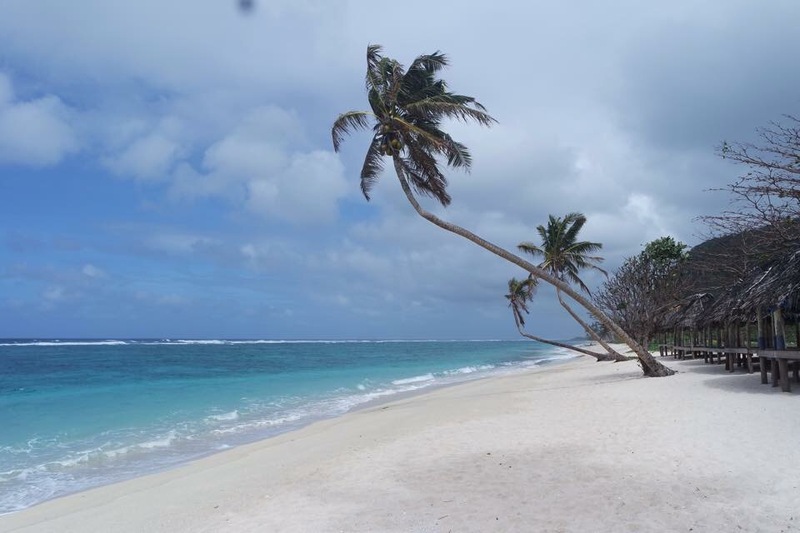 We then made our way across to Savai’i, via Aggie Grey resort. The reason being, island ferries are never on time. We were told to get to the port at 10, turned out it didn’t leave until 2!! Luckily the resort was a little down the road from the port, we started to walk there in the boiling heat and a very kind Samoan local picked us up and took us there. This is just one instance when the Samoan people blew me away with their kindness. 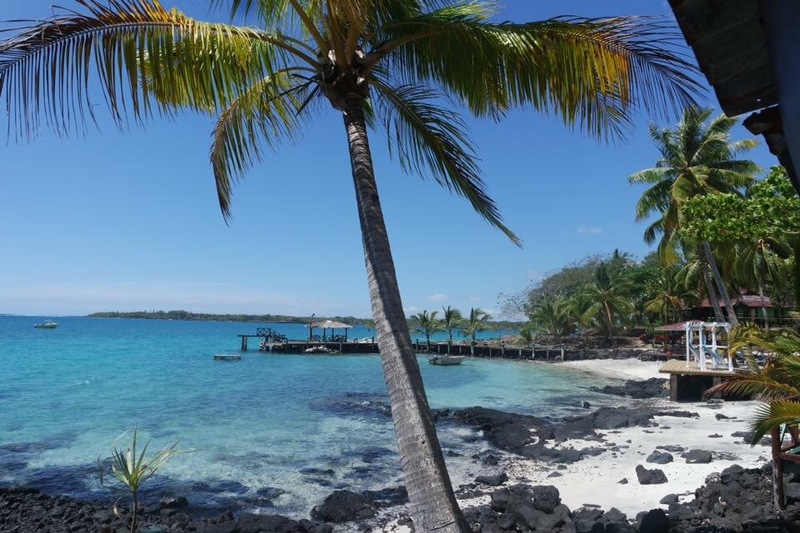 We had only planned to stay in Vaimoana for 3 nights, we ended up staying for a week. The staff there in the end became like family to us, made us feel so welcome and relaxed. It wasn’t like a typical holiday resort, the people who worked there were born and bred locals. Although they were giving us a service through hospitality, it almost felt like we were there to watch, learn and relish in this inspiring, beautiful culture and their way of living. 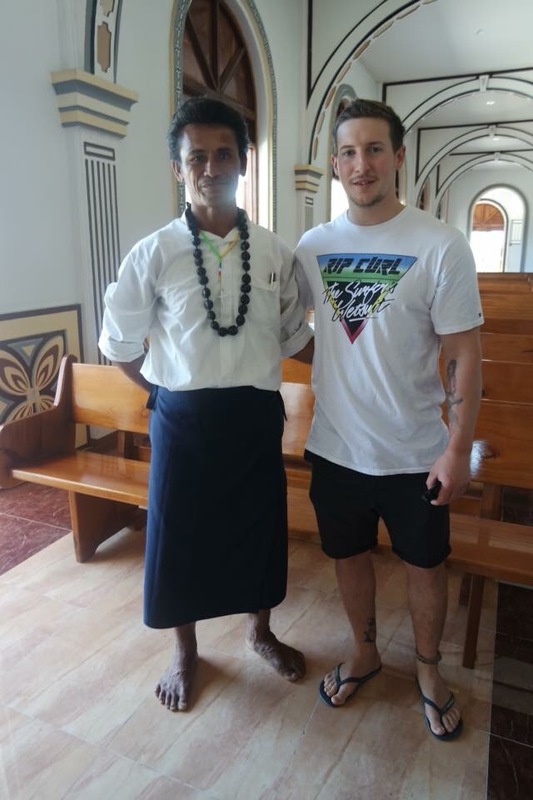 We were invited to attend church on Sunday morning, at the time Tom was wearing a bright colourful island print shirt. One of the Samoan woman at vaimoana said this was fine and giggled. We arrived to church and the whole of town was there dressed in pure white head to toe, I’m talking beautiful long dresses and fasinators! Of course Tom stood out like a sore thumb, luckily I had a white dress on. The singing in the church can only be described really as a choir of Pacific Angels. Everyone sung, with such pride and happiness. It was impossible not to smile. The priest shook our hand after service and a flood of white clothed people flocked back to their fales. That evening, at dusk, our friend Mauo who worked at the resort (and also did the flower arrangement at the church) took us for a walk around the village. Asau village is small and acquaint, especially at twilight. I will never forget that walk and how wild and green the place was. The temperature was still warm and sticky, and the smell of farmland and bonfire stuck out. We met many locals along the way, from babies to pigs. Lots of pigs running around wild and free. As dark began to set a boy with a horn started to blow and the dusty track roads began to empty. We were approached by two boys asking what we doing still out at this time. Mauo explained that she was just showing us the village and how she’s still at work. Every evening at that time the horn blows for around 20 minutes. Samoans believe that during this time everyone should be at home spending time with family and having their meal together. It was a strange concept to me at first, having someone tell you what to do. But I kept thinking about it and I believe it’s a beautiful idea. If more families took this up, they’d be happier and content. People are so busy nowadays in the western world with technology and stupid amount of hours jobs that they forget what’s really important. The number one priority amongst Samoans is family and I think they have nailed it. 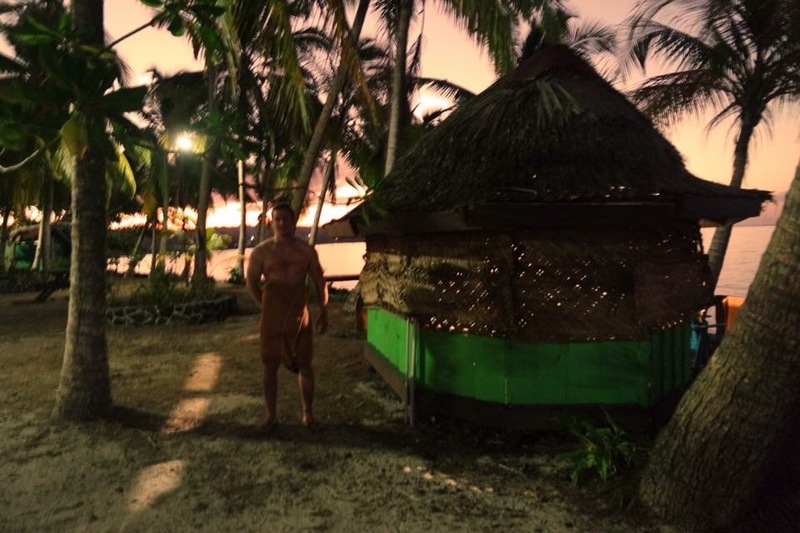 Their life style really did blow me away, I’ve never been to a place so different, and actually really feel involved and absorbed into it like Samoa. Sure, I’ve been to Thailand and met locals and witnessed their cooking skills. I’ve sat up all night drinking rum with the people of Borneo. 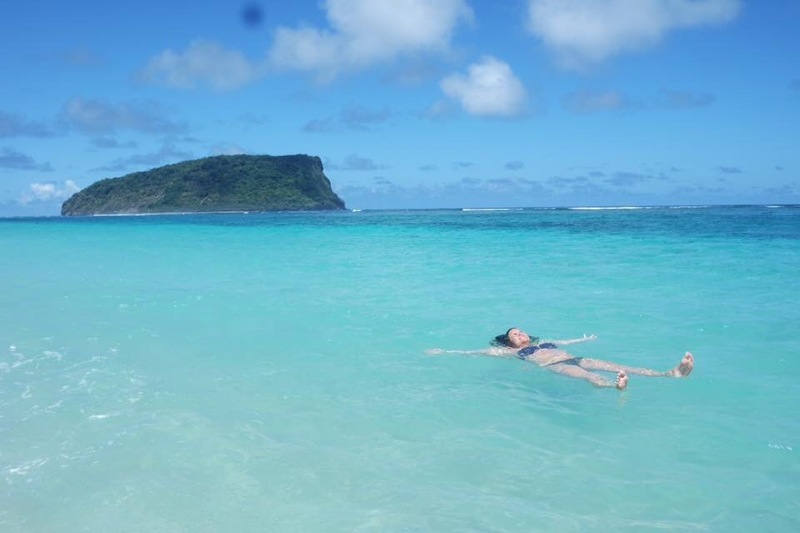 But Samoa was different, the people aren’t trying to impress all the time, they’re not trying to make money out of you, they’re just real and happy you’re there seeing how they live. One evening we were invited to the village to watch a show the locals had put on for the festival that happens every year. Us and an Argentinian couple were the only non locals there. Young kids sat on the ground watching the “stage” with everyone else siting on plastic chairs behind. When we arrived there was no room, it was a huge turn out. People eagerly stood up to give us their chairs and made room for us right at the front, it was so sweet. 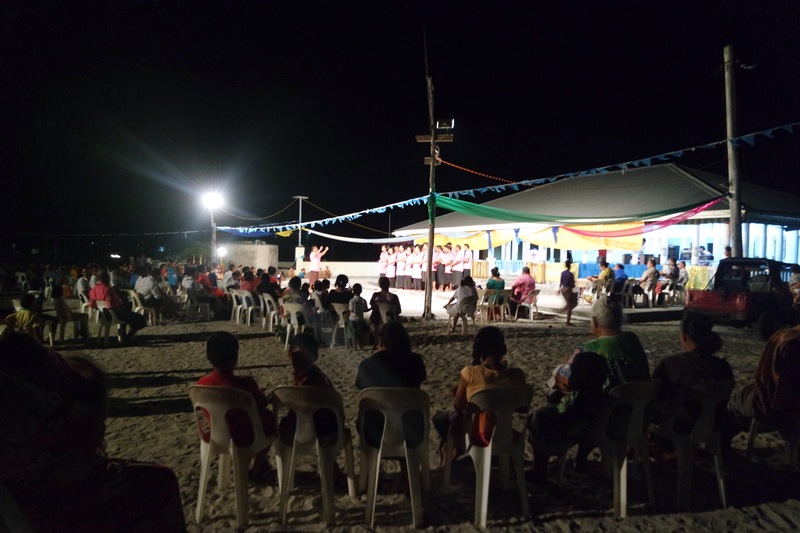 The performances that night were seriously one of a kind and such talent amongst one small village in the heart of the Pacific. From young boy choirs, to traditional Samoan dances from woman and men of all ages. My favourite was a group of teenagers telling old Pacific tales using props as canoes and jungles. It was so creative, and not a word was in English but I learnt so much and understood everything that was happening. It blew my mind how this one small village had so much originality and such a sense of community, I felt privileged to have watched the show as it was completely for the locals. 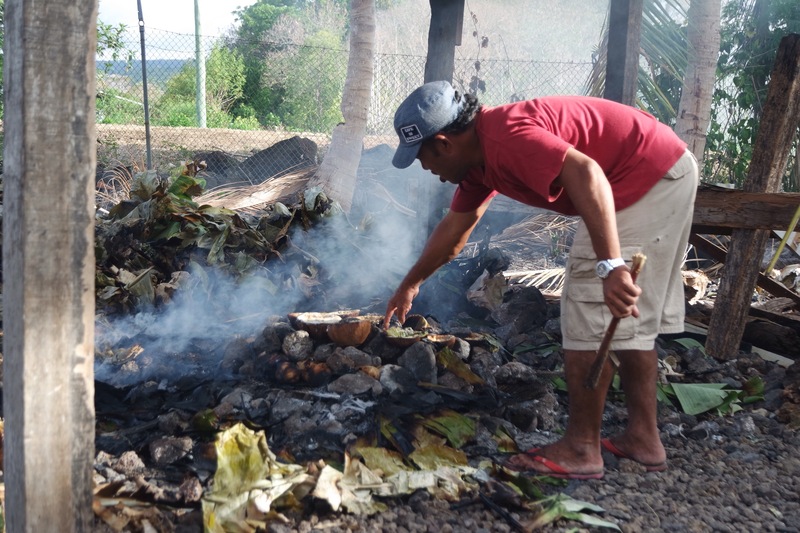 The next day, a couple of the local fisherman were making an umu so we went to watch. 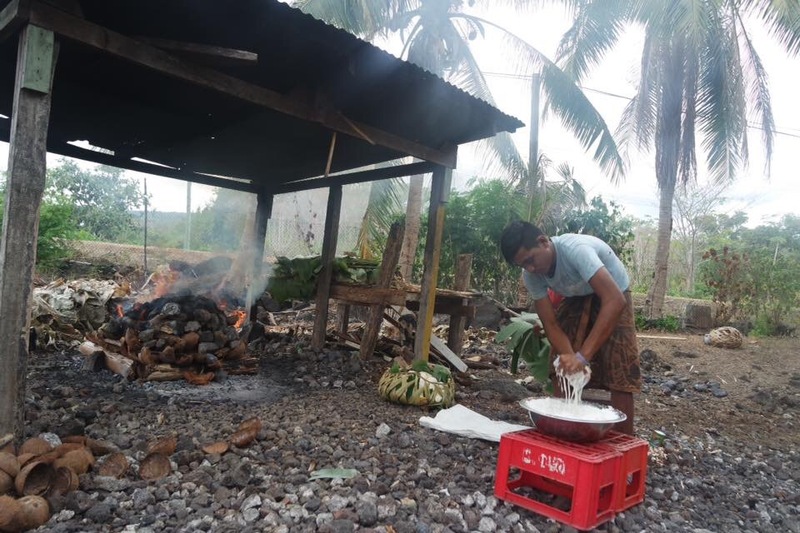 An umu is an oven in Samoa, they make a fire with hot stones on top, put what they want in and cover it in all in banana leaves and rocks. And boy does it taste good, the smoky taste through everything! There are two main foods they cannot live without here. One is coconuts. With such an abundance of trees everywhere, they use them for everything. One guy had scraped all the white flesh out of about ten coconuts and rang it through this straw plant type thing. It produced the most delicious creamy milk in the world! I could have drunk all of it until he told me it makes you “busy” so I soon stopped. With the shells of the coconuts used as bowls they madde the Samoan speciality dish called o’ka. Raw fish, coconut milk, chilli and lime. It’s so delicious and fresh! Just like the Irish have their potatoes, the Italians have their pasta, Samoans have their taro. The other food they can’t go without. It’s a root vegetable, very high in protein and calcium. Looks just like a yam but once cooked in the umu and hit in half, looks just like a fresh bread roll. I had taro ALOT. After a wonderful week in Vaimoana we had to move on, we were farewelled with big flower leis, a lovely guitar sing song and a piece of cake! We became very close to our Samoan family here and I knew it wouldn’t be the last time I’d see them. One of the ladies took us to Manase, only about 40 minutes away. 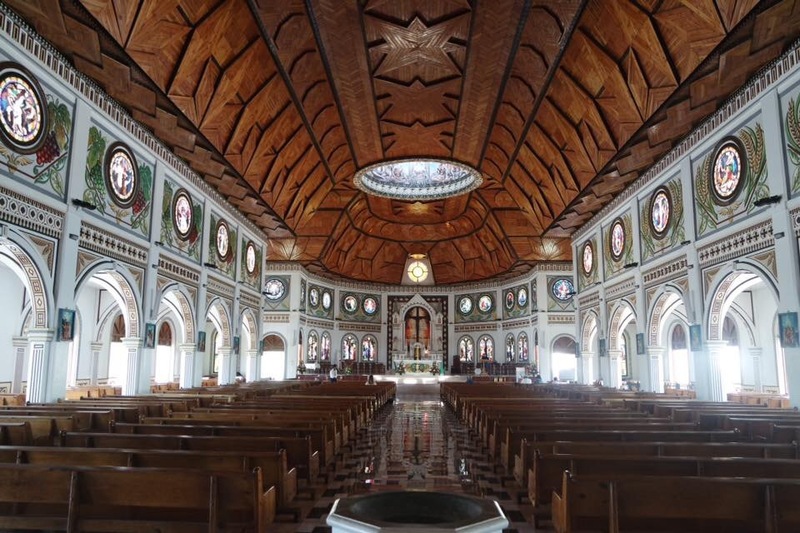 We were told in Apia on our first day to stay there by an old man we started chatting to in the cathedral. He worked there as the cleaner and turned out he was the father of international rugby superstar David Smith. As tom is such a rugby geek he was starstruck and got his photo with him. The old guy was over the moon about us knowing him too. I had no idea who he was, I was just happy to be there. Anyway, we went to Manase to stay at the mans family fales. It was a beautiful place right on the beach. It wasn’t a swimming beach as there was lots of coral, perfect for snorkelling and turtle spotting! We stayed there just one night then headed back to the other island. The last week of our trip we’d planned to splash out and stay somewhere a bit more pricey on Lalomanu beach. It’s a gorgeous stretch of white sand beach and clear turquoise waters, it was voted number 7 in the world for most beautiful beaches. 6 years ago though a tragic tsunami happened right here and killed hundreds of people. We could see some of the affects when driving into it. Many abandoned huts that have just been left to rot. The worst were the huts with gravestones out the front, Samoans traditionally bury their loved ones outside their homes, it was a sad sight. Anyway, we arrived in a beautiful spot and had prebooked to stay in Taufau beach fales. When we checked in we were told they had lost our booking and all the fales were now fully booked. The man in charge was an old guy and very rude and unhelpful. He offered us a room up in the cliff tops a 15 minute drive from the beach. This isn’t what we wanted at all. It was a real struggle to talk to him and he refused to give us our money back. After 6 hours of travelling to get here I was becoming very tired and emotional, I just wanted a shower. 3 whole hours it took arguing with this man to give us our money back, in that time tom had gone in search for other places to stay. A few places on was a cute pink place called Anita’s bungalows. Tom had gone in and the girl said they had no room, but in the corner sat a larger than life lady with a fan in one hand a cigarette in the other. She told tom to come in and he told her our situation. Turns out she was related to the old guy who was rude to us, she was shocked he was acting like he was. 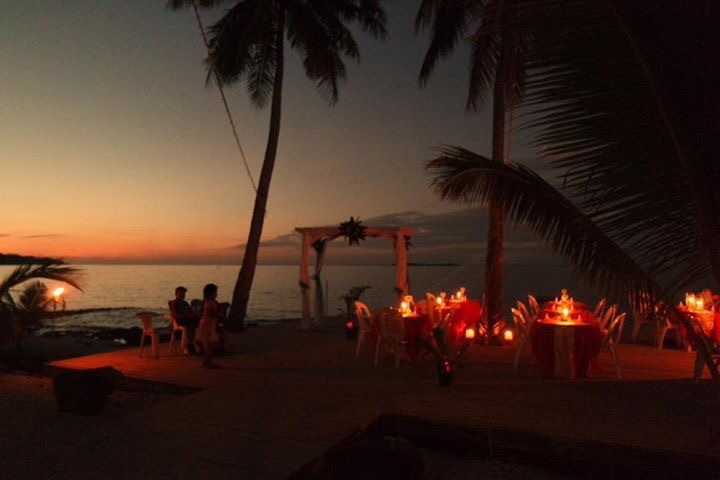 She told tom to walk with her and took him outside to a half finished beach fale where men were working on. She said it would be finished today so we could stay there for the remainder of our trip. Of course, this kind woman, Singalu stuck to her word and it sure enough was finished. We were lucky enough that there was another English couple staying there too. They had rented a car and took us the next day to see all the amazing sites we wanted to see. We went to Piula cave pool first, the water was superbly clear and visibility under water with eyes open was incredible. 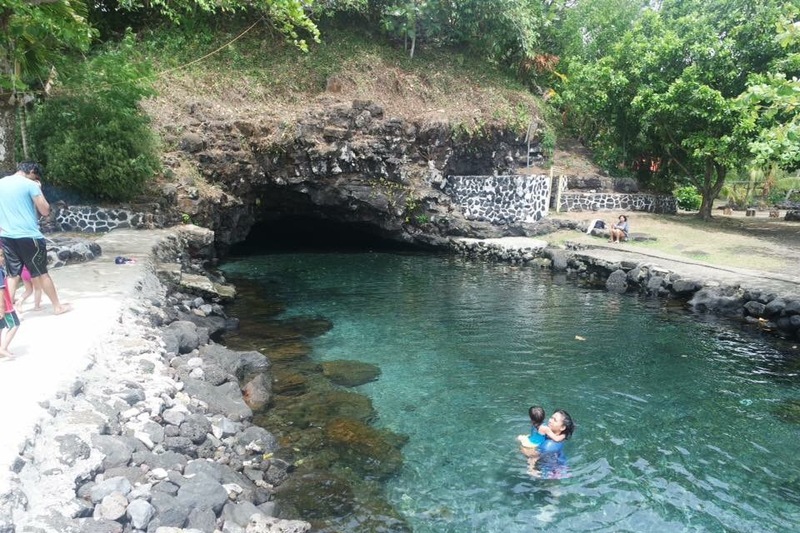 The fresh water pool led into a dark cave which if you swim under holding your breath would take you through to another cave. None of us fancied doing it though as we wasn’t sure how long you had to hold your breath for! We then went to To Sua ocean trench. I had been the most excited for this, after seeing countless photos of it and wanting it to live up to expectations, it did not disappoint! The amazing trench is situated right near a long strech of beach, for some reason in my mind it would be in the middle of a jungle somewhere. We were lucky enough to be the only ones in there for some time. The steps going down are ridiculously steep, my advice is do not look down! There’s a platform at the bottom you can jump off from, the water is tidal so will drag you right across one side then drag you to the other, for that reason there are ropes everywhere you can hold on to, it’s so much fun. To Sua I think is one of the most magical, natural and beautiful things I’ve ever seen. It looks even more magnificent in the flesh, such a hidden gem in the Pacific. We stayed at Anita’s for a week, by the third night it was just us there and we were treated like royalty. Singalu had three girls working for her who were so sweet and became our friends straight away. The food we had for dinner every night was amazing home cooked meals, so much of it too! Every Saturday night at Anita’s they would have a local nightclub. Where a dj would come and play and all the locals would finish up work and come here to drink, this was the only place really they could come. It was the talk of the town alright. Again, we were the only westerners there that night, it was wild! 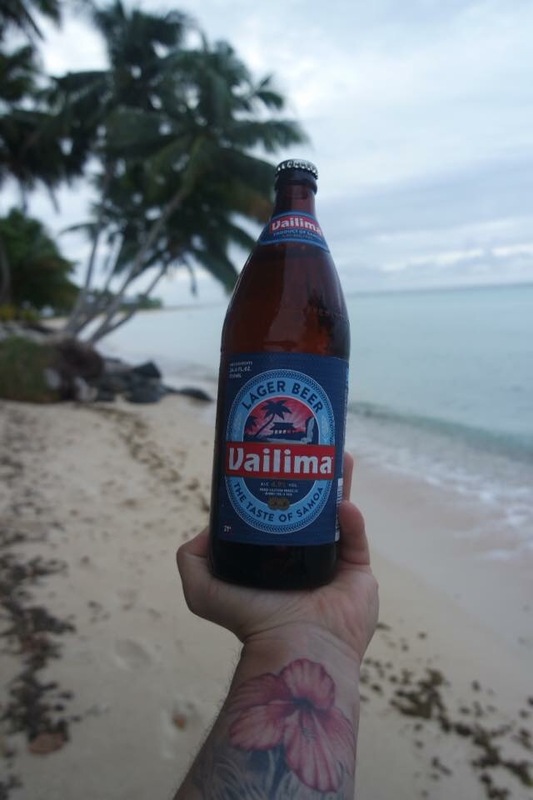 Samoans letting loose is a sight and a half, they know how to party that’s for sure. Singalu kept the nightclub going to honour her daughter, Anita. Unfortunately she was working the morning the tsunami hit, no one had ever seen or heard about a tsunami here before. So when all the water was pulled right back and the reef was left bare, people were walking up to it, they didn’t know what was going on. A guy that helped out there was telling us he too was there that morning and could sense what it was, he tried to bring Anita but she went back for some reason. Lots of people realised eventually and ran for the hills. It’s devasting to hear the local people’s stories, everyone lost someone they know. A taxi driver later told us how him and his family were in bed sleeping when it hit and were washed around like rag dolls, being hit by trees and buildings, but they were the lucky ones who somehow survived. When we were there, a huge earthquake hit the coast of Chile. A tsunami warning was put out that night for the Pacific Islands and New Zealand. You could sense that this scared the locals and brought it all back for them. I was on the news websites all day researching what time it would hit, they had predicted around 3am. They didn’t predict anything big like the last one but nevertheless it was still scary. I was thinking maybe we should have taken the cliff top room the rude man was trying to give us, maybe it was a sign. 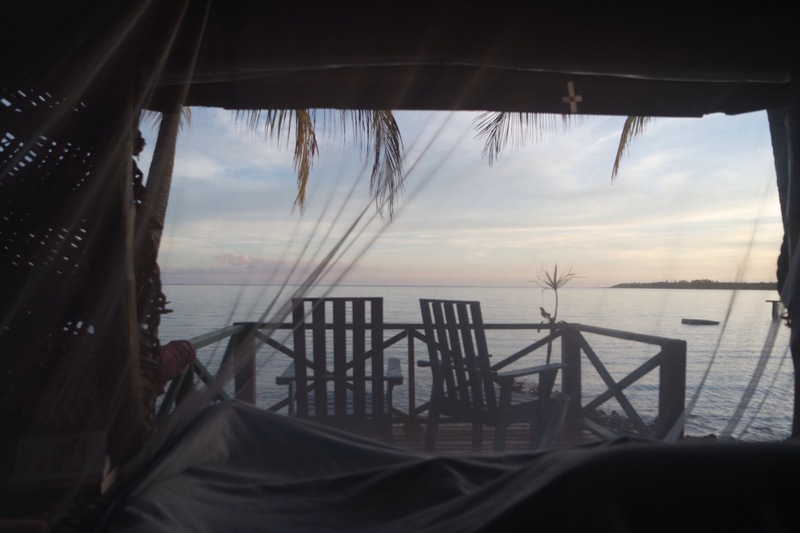 I was up most that night peeking through the wood in our fale situated right on the beach. The waves were loud and strong but all was completely fine. It really hit home just what these people must have gone through and how something so devastating can happen in such paradise. When we were staying at Anita’s it was the start of the rugby World Cup. Watching it on a little screen on a paradise beach was a bit bizarre but I wouldn’t of had it any other way. The Samoans are crazy about rugby, they produce some of the best players in the world. It’s sad as a lot of them go to the all blacks and the countries own team is left struggling. It’s funny how some Samoans absolutely adore the all blacks and some of them hate them. Because of the time difference, Samoa were playing at 2am, all the girls brought their families to watch it on the small screen and they all had a slumber party with made up beds on the floor. I wish I could have stayed up to watch it all but I was real tired, I could just hear the screams and cheers from my fale. 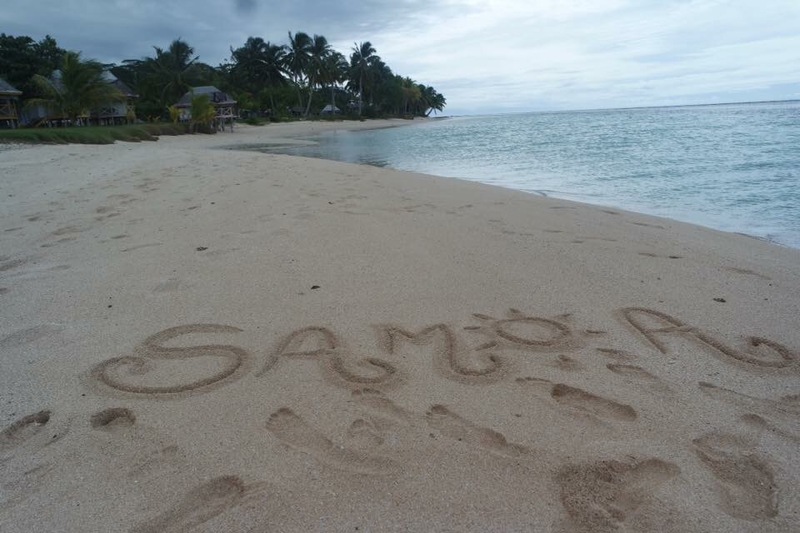 Three beautiful weeks went by in Samoa and I had the time of my life. There’s no doubt in mind that I’ll be back again. Everything from the food, weather, landscapes and people were magical. I have all my Samoan usos on Facebook and have already been invited back to Asau, on the condition I have a child to bring (they love babies!) so I guess it won’t be for a few more years yet! ← Ohakune, a winter wonderland in May.